Chicago Cubs manager Joe Maddon was on his weekly 670 The Score spot with Bernstein & McKnight, getting into a range of topics. Among the most timely are the injury updates. Joe Maddon on balancing doctors' feedback with that of an injured player like Yu Darvish: "I always listen to the player first. He knows how he feels … I never dispute or second-guess if someone says he's injured." The results of the MRI aren’t in yet, but I think we all kinda know the score. 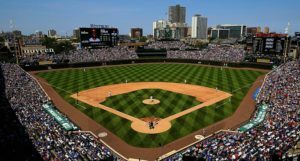 Even if the MRI is clean – which would be the third clean MRI this year – what exactly are the Cubs supposed to do? If Darvish keeps feeling pain, then he keeps feeling pain. And if he’s not going to pitch through it (effectively! ), then that’s that, and you hope the offseason changes things. I don’t mean to sound hostile, but I’ll admit that I am frustrated by the situation. Like the Cubs and Darvish, no doubt, I just wish there were more clarity. And since there isn’t, I’m frustrated. Kris Bryant (shoulder) is feeling "pretty good" and "trending properly," Joe Maddon says. He still doesn't have a finish line in sight for Bryant. Perhaps tellingly, Maddon said that he expects Mike Montgomery (shoulder inflammation) to be the first of the injured Cubs to return. He’s eligible to come back in just a few days, but then again, we weren’t expecting to see any of Bryant, Brandon Morrow, or Darvish in that span anyway. Hopefully Montgomery will have missed just one start when this is all said and done. 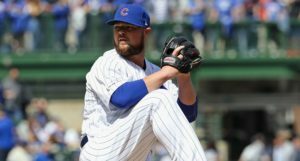 Tyler Chatwood cannot take another start for the Cubs. Joe Maddon acknowledges that Addison Russell's hand is bothering him, but he wants to play and will continue to play. Maddon went on to point out that Russell's defensive play has not slipped. As we tracked, Russell’s offensive production fell off of a cliff when he re-injured the knuckle on his left hand, and it hasn’t recovered in the months since. 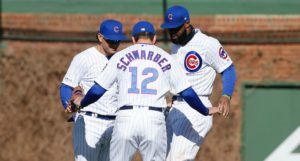 The Cubs and Russell are clearly making a decision that they’d rather have his defense in there – and no bat – than play Javy Baez regularly at shortstop and someone else at second base. Being without Bryant makes that a closer call, but whenever Bryant returns, if Russell is still limited, the Cubs will strongly have to consider working more starts in at second base for Ben Zobrist and David Bote, with Russell hitting the bench, if not the disabled list.